Patients are weight bearing as tolerated. Crutch use as needed post-operatively for safety and to maintain good gait pattern and posture. Can wean to single crutch or cane use, then to no assistive device once able to walk with normal, safe gait pattern and with confidence in involved leg. Range of motion will be locked in full extension in a brace for 4 weeks. In Therapy, progression of flexion for week one is 0-30 degrees, week two 30-60 degrees, week three to four progressing up to 90 degrees and adding passive range of motion to 90 degrees in home exercise program. Important not to push for flexion past 90 degrees for first 4 weeks to protect repair. NO PATELLAR MOBILIZATIONS FOR 4 WEEKS. Regular attention to proper quadriceps recruitment and knee mechanics will optimize outcome. Return to sport and activities are dependent upon passing a functional sports test. Nurse visit day 2 for dressing change, review of medications and instruction on a home program. Effleurage for edema, gentle soft tissue mobilization. Passive flexion should be limited to 0-30 degrees. Ankle pumps, quad-sets (every 30 mins), leg raises in multiple planes. Extension stretching to hamstrings and calves to maintain extension range of motion. Well-leg stationary cycling and UBE. Upper body weight machines and trunk exercises. Initiate single-legged stance balance/coordination activities with fingertips on stable surface (kitchen counter-top). Gait weight bearing as tolerated with brace locked in extension. Passive range of motion 0-30 degrees. Continue to progress weight bearing and functional mobility as able. Progress balance and proprioception activities, add calf raises. Continue with effleurage for edema, gentle soft tissue mobilization. Passive flexion for WEEK TWO should be limited to 30-60 degrees of flexion, WEEK THREE and FOUR progress to 90 degrees. At this time, patient should be able to hang knee off of table twice a day for passive flexion at home. Passive range of motion 0-60 degrees by week 2, 0-90 degrees by week 4. M.D. visit at 1 month post-op. Brace open without range of motion limitations for day-to-day activities and exercises. Continue with soft tissue mobilization. Begin gentle patellar mobilizations/ initiate scar mobilization after week 4. Light or no resistance stationary two-legged biking with high seat position without brace. Progress knee bending stretches with self assisted technique (strap, other leg, wall, etc). Light resistance leg press less than 90 degrees knee flexion, abduction/adduction hip machines at the gym. Initiate weight shifting, short-arc knee bends, mini steps ups, and proprioceptive exercises. Pool walking and workouts with brace locked in full extension as soon as incisions are well-healed. Gait brace open, increase gait mechanics; wean off brace as able. Passive range of motion 0-105 degrees. Continue soft tissue, patellar, joint mobilizations as needed. Increase range of motion to full knee flexion. Bicycling (stationary or road, no mountain biking) at normal seat height without brace. Functional exercises should focus on eccentrics. Increase depth of knee bends and increase height of step-ups. Continue to increase intensity and resistance of other exercises. Passive range of motion full. Initiate stationary biking. Add lateral exercises (i.e. lateral stepping, lateral step-ups, etc.). Continue all exercises with emphasis on closed-chain, functional and proprioceptive program. Increase resistance of cycling, stair machine, and pool programs. Initiate Sports Test I and running program. Develop sport-specific exercises and training program. Maximal eccentric focused strengthening program. 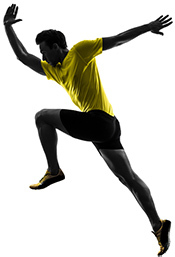 Begin light running program as able to demonstrate good strength and mechanics. Initiate sport specific training. Increase strength, power, and cardiovascular conditioning. Goals are to develop maximal strength, power, and advance to sporting activities. Resisted closed-chain rehabilitation through multiple ranges. Running program, balance drills and agility program. NOTE: All progressions are approximations and should be used as a guideline only. Progression will be based on individual patient presentation, which is assessed throughout the treatment process.